Vintage Metal... the words bring me back to Hair Metal Bands of the 80's.. lol. When I think back to the fun of my youth.. lol.. I can't help but smile! (this trip down memory lane was head banging - lol). Vintage Metal HERE is a fun card. Created for a wonderful lady, Cindi, who purchased a basket for a favorite author of mine, Brenda Novak, who does a Diabetes Auction every year. Leave me a comment and let me know what you think! Cindi likes Vintage... Soho Subway (#130140) Designer Series Paper is just that! It has Summer Starfruit worked in so this Summer Starfruit card stock (#126839) is a warm base. Running the Soho Subway Designer Series Paper through the Big Shot Die-Cutting Machine (#113439) and the Alphabet Press Embossing Folder (#130916) for a cool aged look to the Letter Press Printed Page. 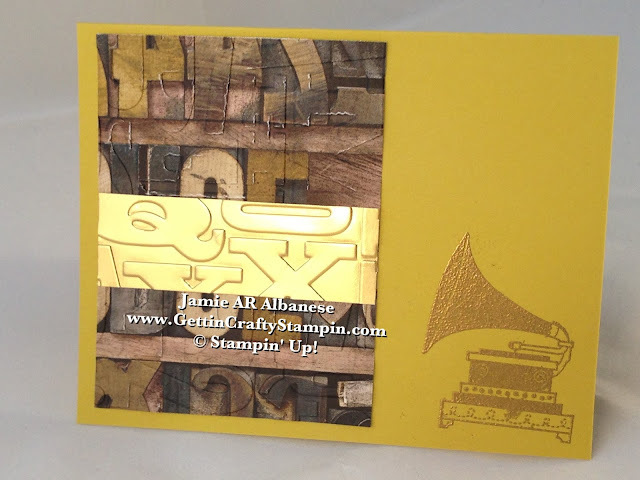 The new Gold Foil Sheets (#132622 Holiday Catalog pg.28) are so amazing... here embossed with the Alphabet Press Embossing Folder so it really shines up the look to this cool texture. 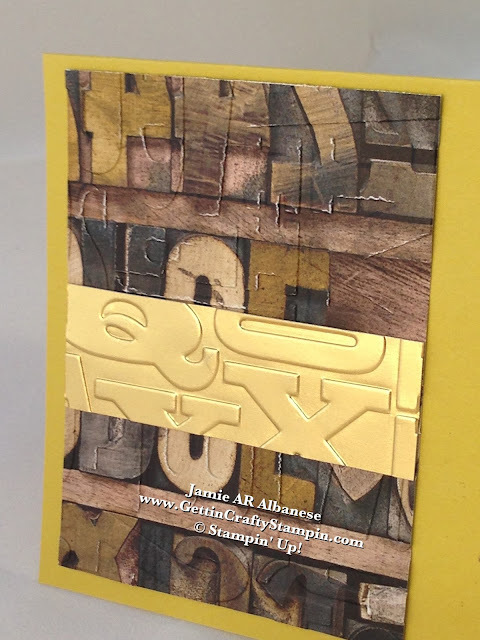 Timeless Talk stamp set (#126607) is so elegant, fun and classic. 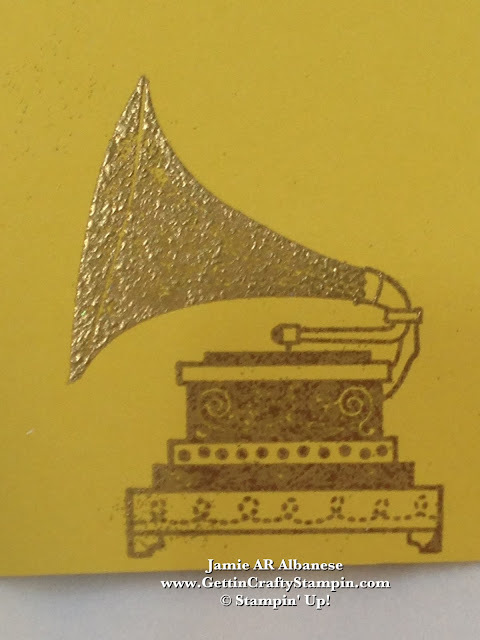 It brings me back to when my Nanna and Pappa played records during the holidays.... here stamped with a Versa Mark Pad (#102283), covered in Gold Embossing Powder (#109129, heat set for a stunning vintage shine thanks to our Heat Tool (#129053). 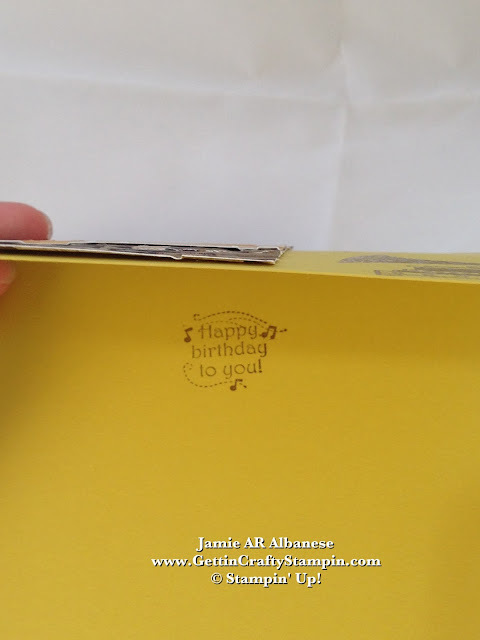 Adding this sweet song to the inside of the card is uber easy and fun. (It makes me nod my head a little... lol). Can you hear the music?? When you combine the old with the new, it's amazing what you can do! What memories does this bring back to YOU?? Leave me a comment and let me know. Metallic, Vintage and Texture.. bring back wonderful memories. When I think back to the fun of my youth.. lol.. I can't help but smile!